One of Hannah Wicklund’s key influences growing up was her brother, Luke Mitchell. Wicklund & the Steppin Stones are currently on the “Sibling Rivalry Tour,” playing 45 dates with Mitchell’s band, the High Divers. By nature, genres like the blues, funk, and jazz are meant for the stage. Groove and freedom of musical expression are at their heart, and they work best with the kind of kinetic, effervescent energy that can only be captured with a live audience. Which is why it makes perfect sense that Hannah Wicklund, 20-year-old guitarist and frontwoman of her blues-rock trio Hannah Wicklund & the Steppin Stones, lives for the stage. 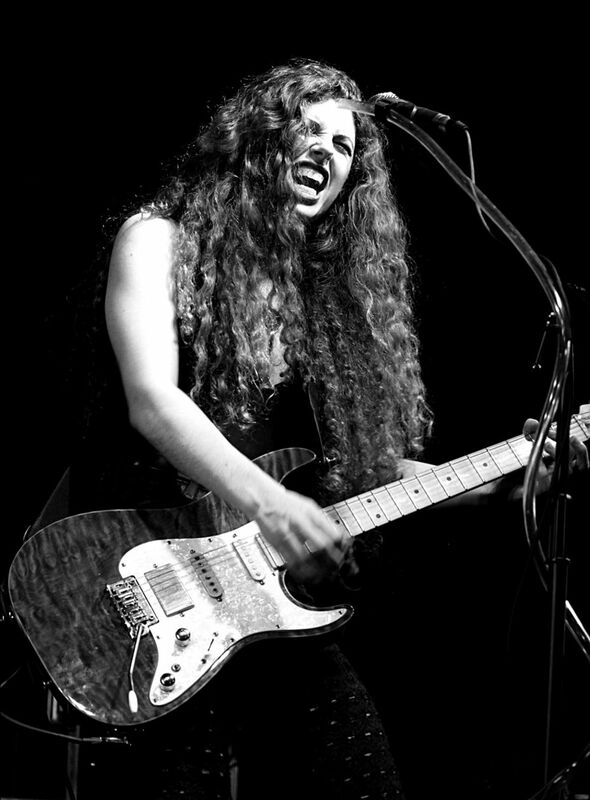 “I’ve played as many shows as I can possibly book my whole life,” she says, “I don’t turn gigs down.” And that’s no small number, considering the guitarist has been a bandleader since the age of 9. Wicklund began her musical education not long after she began walking and talking, and claims to have learned everything she knows about the guitar onstage. When she describes her work, it’s glaringly obvious that a passion for performing is in her blood. By extension, she sees her albums mostly as advertisements for her live shows. So her new Hannah Wicklund & the Steppin Stones, released in early 2018, was cut live in the studio, with the stage in mind. (Naturally, she hates overdubbing.) If the 10-song collection is meant to act as a teaser, it gets the job done—revealing the songwriter’s emotional depth and unflinching spirit as she drives the music forward in every second of every track. Wicklund has more than one talent, as she’s capable of gripping an audience with her soulful, sometimes raspy vocals and clever, thoughtful lyrics. But in terms of musical aspirations, those elements of her songwriting aren’t nearly as important to her as becoming a better guitarist. For any dedicated musician, the bar is always just out of reach, and Wicklund places classic-rock idols like Lindsey Buckingham, Jimi Hendrix, and Jeff Beck on a pedestal. 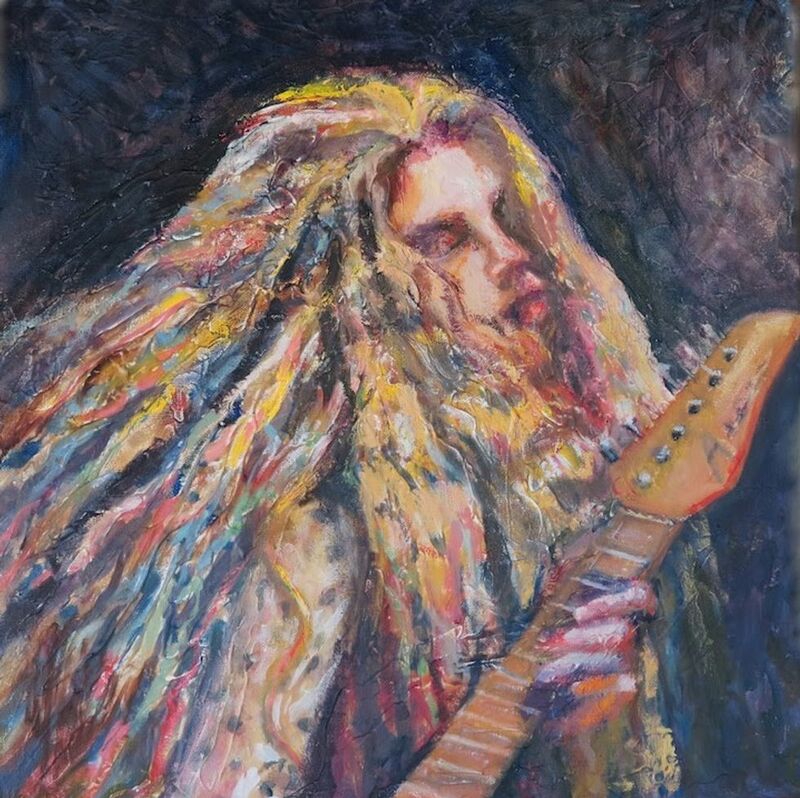 She’s a fan of overdrive, dropped-D tunings, and a power chord or two, but is currently obsessed with improving her fingerpicking technique, and similarly connects with more delicate, nuanced guitar work—something revealed in her interest in a band like Rush, whom she admires for their intricate and expressive instrumental compositions. As she furthers her already accomplished career, everything to her is about expanding her musical vocabulary and sharpening how to better articulate herself on the guitar. While she may not be a gearhead, Wicklund’s definitely a guitar nerd, which comes across when she describes why she goes for Tom Anderson guitars onstage, but Teles in the studio. 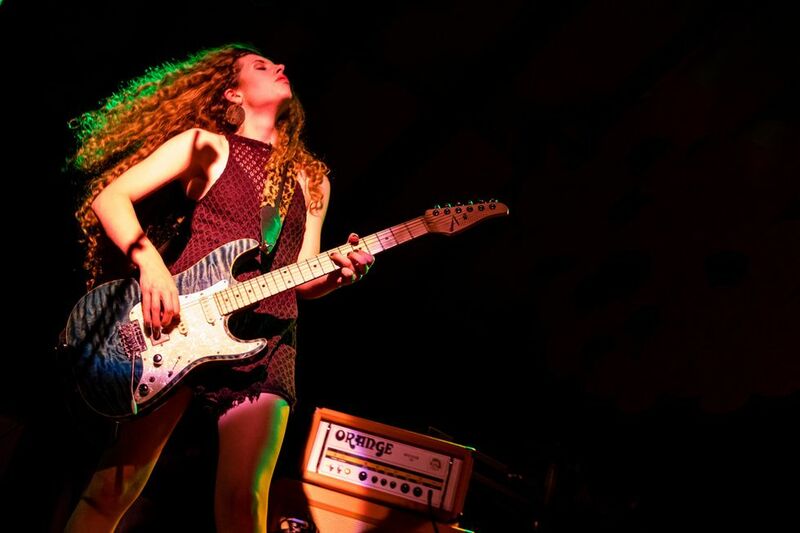 The dynamic, up-and-coming guitarist and songwriter goes into more detail about her influences, writing approach, and gear preferences in the interview that follows. You started out so young. How did you begin playing guitar? I started playing piano when I was 3. My parents got me into playing music, and I started out by playing Beatles songs. I learned 60 Beatles songs by the time I was 7—I was obsessed. Then when I was 8, we had to get rid of my trampoline and my dad got me a guitar instead. He taught me my first couple of chords, and I started taking lessons immediately. About six months after I started playing guitar, I started the band. I feel like most of my guitar skills were developed from playing live with the band. That’s kind of the foundation of my playing. My dad was a drummer for the first homegrown rock band on Hilton Head in South Carolina—where I’m from—about 35 years ago. When I was born, he picked up guitar, but it was always more of a hobby for him. I also have an older brother and an older sister who are both musical. Mainly my brother—he’s seven years older than me, and when I was 6 he already had his band, and I would be in the bars until midnight watching him play. That was my comfort zone, and I fell in love with every aspect of playing in a band. How did you form a band at 9? I got connected with some kids my age, and we just started playing together. The first couple of rehearsals were very spread out, but then once 2006 rolled around, that spring was when I really found the guys that I started the band with, which was a drummer, Mark Bradley, Jr., and my bass player, Mick Ray. We got our first gig playing at a Relay for Life [the annual international cancer research fundraising event]. We played “Rockin’ in the Free World” by Neil Young, and then we played an event at a school and things snowballed from there. Hannah Wicklund’s self-titled album was produced by Sadler Vaden, guitarist for Jason Isbell. Wicklund cowrote a few songs with Vaden and former Cage the Elephant guitarist Lincoln Parish, but her favorite track on this release is “Strawberry Moon,” which she penned herself. You’ve named AC/DC, Jimi Hendrix, and Jeff Beck as influences. What about your influences really inspires you? My biggest influences overall are Tom Petty, Jimi Hendrix, Fleetwood Mac, and Jeff Beck. To me, they’re all completely authentic. I don’t think I could listen to any one of their songs and think, “This is corny; this is forced” or anything like that. Fleetwood Mac’s and Tom Petty’s songs are timeless. They were able to write No. 1 hits that resonate and connect with a ton of people without losing themselves. How do you maintain that authenticity in your music? I’ve been putting out music with the band since I was 12, and when I was younger I was able to pull from some real-life experiences, but [I would also create] circumstances to write about in my head. With the new album, I feel like for the first time I was able to draw from my life completely. That’s what any good songwriter aims to do, is to draw from their real-life experiences—’cause that’s when things are going to sound the most raw, and the most like you. I feel like my life finally caught up. Do you see yourself as more of a guitarist or a songwriter? How have your influences informed your guitar playing? I love being a guitar player. I’d rather be known as the girl that plays guitar than the girl who sings. Jimi Hendrix, Jeff Beck, and Lindsey Buckingham have so much expression in their playing and are able to emote so much in their music, let alone the lyrics and everything after that. I feel like I took a lot of influence from them as far as phrasing. Then especially Lindsey and Jeff Beck do a lot of fingerpicking, which is something that’s always intrigued me. I’m always trying to experiment a little more with the fingerpicking stuff. “I learned 60 Beatles songs by the time I was 7—I was obsessed,” says Wicklund. She did that on piano, but now the multitalented siren’s main instruments are guitar and her voice. You incorporated some fingerpicking on the new album in “Shadow Boxes.” What does that song mean to you? I cowrote “Shadow Boxes” with Lincoln Parish, who was the guitar player in Cage the Elephant. I cowrote two or three of the songs on the album with Sadler [Vaden], my producer, but this is the only song on the album that I cowrote with an “outsider,” and I’m super happy with the way that it turned out. It’s my version of a social commentary. I’m guilty, just like everybody else, of getting too sucked into social media. Everything is set up to be so perfect, and you start to notice the negative effect that it has on you after a while. I’m trying to say that everything isn’t perfect, and even my fingerpicking backing track wasn’t perfect—but that’s also the style I love. Music breathes and it’s not this perfect manufactured thing wrapped up in a little bow. Is that the kind of energy you try to capture in the studio? We’ve tracked live on every album I’ve ever recorded. We did the whole album in seven days. I’ve never really done the studio in a polished way where [everyone records their tracks individually]. It just seems really cold to me. We set up shop like a rock band and played through the songs until we felt like we had the take. When you’re only doing a handful of takes on each song, they’re not perfect, but they’re right. As the lead guitarist, vocalist, and songwriter, it looks like you supply the main source of power in the trio. What’s that like? When you’re in a trio, everybody has to pull their weight a little more. But I feel like in the last year and a half, my confidence as a frontperson has developed much more. Going through changes over the last 10 months has heightened that side of it. Because I was playing with different people, I had to become the majority of the show in order for me to maintain a consistent show for people coming to see me every night. But it’s always been my band, I’ve always been the one pulling all the strings, and I was always the manager and booking agent and everything has always been ultimately my decision. What are some of your favorite guitar parts on the album? I love playing “Meet You Again.” I’m a sucker for dropped D. It’s really fun to play live—there’s something so ballsy about playing that guitar part even though it’s super simple. It’s just raw. But I think my favorite guitar solo and my favorite song overall is “Strawberry Moon,” that I wrote completely by myself. Within half an hour I’d written the whole song. It’s not the most flashy, and it’s not the most in-your-face on the album, but it’s the most personal, based on my ex and I’s relationship and how the first few months of the year had been going. That was also one of the first guitar solos that we tracked where as soon as we got done [recording], everyone was like “That was it!” That’s always a good feeling, when people have a strong reaction to something that you play in the studio. And that song was early on, so I feel like it helped set the tone for the rest of the album. I noticed that was the only track on the album where you used slapback delay. What guided some of your production choices? One of the reasons why I really wanted to work with Vaden on the album is because he’s a guitar player. He’s the first producer I’ve worked with who’s [a guitarist]. He helped me get a little more creative with guitar tones. I’m a fan of my long-hall delay—I really like the spacey sound, especially live. But on the album, that can muddy things up a lot. He helped me rein that in, and the slapback delay [on “Strawberry Moon”] was all him. What were some of the guitars you played on the album? I was using a lot of Tele tones on the album, which I love. But we also used some 12-strings subtly in there. On “Looking Glass,” we used a vintage 12-string, short-scale, black-and-white Rickenbacker [Tom Petty Limited Edition]. It was so sick. That’s the sound on that song at the end, where you hear that [sings the melody]. It reminded me of a troubadour [laughs]. That’s one of my favorite things that we added. On “Shadow Boxes,” I was playing a really old small acoustic [1966 Gibson B-25]. It’s funny, because normally whenever I’m recording I try to fit in a Martin HD-28 or some huge acoustic, and this time I used a small, really clean-sounding acoustic—and it’s my favorite acoustic sound that I’ve had on any of my albums. Which guitars do you bring on tour with you? I play Tom Andersons live. I’ve been playing those since I was 8 or 9. The playability on those guitars is unmatched. I feel like I can play faster and cleaner on them. I don’t like a super chunky neck—a lot of their models have very slim, tapered necks, which I love. And I love the way they sound: Their bridge pickups and humbuckers are always very beefy and heavy and straightforward. They’re just amazing guitars. What are your go-to effects? I know some people dog on the pedalboard and some people are purists, but I like my pedals. I use the T-Rex tube reverb, which I bought in Boston years ago, and it’s my favorite reverb pedal. It’s warm, thanks to the tube, and it’s super reliable. I have that on always—I’m not a huge fan of dry guitar tone. The Keeley modified Blues Driver is my favorite overdrive pedal. Did you play any other instruments in the studio? We put a little bit of keys on a couple things. [Vaden] did the keys on “Ghost” and I did the organ sounds on “Crushin.” In the past, when I’ve had more of a say in the producer role, I’ve always been very nervous about adding any instrumentation that I can’t recreate live. For me, the album is more of a representation of what we are live. I’m just eager to play. The album has always been [an add-on] to the live show. With “On the Road” we threw in some congas, and even that was kind of a risk for me that I’m happy I took. But that’s about as crazy as we get instrumentation-wise. If you could only make one more album, what would it be like? I would be brutally honest about a lot of things—nothing held back. This album was more inward-looking, and if I could only have one more album, it would be more outward-looking. I would be writing songs about things that are going on in the world today, and about how people are being affected by so much chaos and negativity. Musically, it would sound much more on the side of “Meet You Again,” “Mama Said,” and “Strawberry Moon,” and I would like to write it with some badass musicians, where the music is taken on more of a ride. More in a Jeff Beck realm where the music is able to express more and isn’t just relying on lyrics. I’ve also been listening a lot to Jeff Buckley’s album Grace. That album is sick. I think that’s along the lines of what I’m thinking of right now. If you could perform in a dream show with any musicians you could choose, who would they be?Me sitting in with Tom Petty and the Heartbreakers and Stevie Nicks. I always felt like Tom and Stevie had this really cool musical connection and friendship. That’s something I’m on the hunt for in my own life—finding the musical equivalent of that relationship. They had this respect and admiration for each other. I would love to experience that onstage. Armed with her Tom Anderson Top T, red stilettos, and bold, unshakeable force, Hannah Wicklund fronts her trio in the official music video for the lead single off her new self-titled album like a mythical creature warding off the enemy. Flanked by jungle foliage and a python resting easy at her feet, Wicklund digs into a wah-wah solo and exhibits the raw power she unleashes in every performance.